The modern rustic design makes it the perfect centerpiece straight from stove or oven to table. Seasoned for a natural, easy release finish that improves with each use. Seasoning is a necessary step in using cast iron cookware. Oil is baked into the pores of the iron at the foundry to prevent rusting and to provide a natural, non-stick cooking surface eventually. After cooking, clean wok with a stiff nylon brush and hot water. Using soap is not recommended, and harsh detergents should never be used. Avoid putting hot cast iron into cold water. Towel dry immediately and apply a light coating of oil to the wok while it is still warm. Store in a cool, dry place. 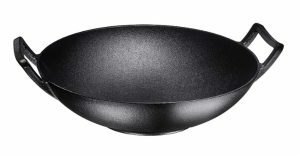 This cast iron wok by Bruntmor has a customer rating of 4.6 out of 5.0. I like the handles on this wok compared to Amazons’ cast iron wok. Check Amazon’s price and availability here.